Ever since I got a FitBit for my birthday earlier this year, I’ve been obsessed with tracking everything. If you know me, that’s not too surprising, as I’m a Type A organized person as it is. However, the FitBit brought out something new. I wasn’t competing against other people, I was competing against my (admittedly physically lazy) self. Suddenly, I had to walk at least 5,000 steps a day, and I almost had a party for myself when I reached 10,000 steps on day 2 with the FitBit. However, I’m also driven by side hustling, so of course I started thinking about how I could make money from this new obsession. No way someone would actually pay me to work out, right? That’s almost too easy. However, it’s not a gimmick: there are companies out there who are willing to reward us for being healthy! Keep reading to find out which companies are willing to reward us for our healthy habits. If all you want to do is earn money from your daily exercise habits, there are two websites you’ll want to check out. One, however, does come with a caveat, so make sure you’re very committed to your goal before you sign up! Pact is an exercise, health and wellness website that encourages you to make a “pact” with yourself or your friends. You can set your pact for virtually any health goal you may have, including exercise, eating enough veggies, or tracking the food you eat. Once you set your goal, or pact, you then make a monetary commitment to sticking to it. Yes, this means if you miss your pact goal, you’ll end up owing money to Pact. However, if you make your goal, you earn money every week you achieve your goal. Rewards are based on the number of days you commit and complete your pact. If you meet your goal, you’ll get a reward between $.30 to $5 per week depending on the number of activities you committed to. Pact does this by using the money from members who have not met their goals and rewarding the members who have met their goals. Obviously, this does not bode well for you if you typically can’t stick to goals. Don’t sign up for Pact unless you’re absolutely sure you’ll stick to your goals – I don’t want you to pay money in order to use this app! AchieveMint is another website where you track your health and exercise goals and, after accumulating 50,000 points, you’ll be rewarded with a $50 Visa card. Unlike Pact, you’re not making any specific goal, so you won’t be punished for not meeting goals by a certain time. All you do is link up your fitness tracker, or input any healthy activities you have done, and you’re rewarded a certain number of points until you reach 50,000. AchieveMint makes money from ads by companies promoting healthy living activities, and they do aggregate data to sell to companies tracking health trends. Currently, there is a waiting list to get started with AchieveMint, but of those who are using AchieveMint, it doesn’t seem to take very long to get your 50,000 points to cash in for your $50 gift card! In addition to getting money just for working out and keeping track of your health goals, you can also sign up for websites that give you discounts on things you already buy, or let you donate your points to charity. Nexercise is an app on your phone where you track your workouts, daily walks, etc. and are rewarded for your activities in the form of gift cards and automatic discounts to merchants like CVS and Home Depot. You can also save up your points to put toward gift cards to merchants like Sephora and Nordstrom’s. Higi is similar to Nexercise, except you don’t need to download anything to your phone. Just sync your activity tracker (FitBit, JawBone, Garmin, etc.) to Higi and watch your points roll in! Unlike Nexercise, Higi’s partners are a little more unique – you won’t see rewards to Home Depot with Higi. Instead, you’ll see discounts on BucketFeet shoes, Orgain protein shakes, and Element Bars, to name a few. One thing I’ve liked about Higi is that I’ve only been using Higi for a few days, and I can already cash in for a few rewards (like those protein shakes). It may not be free money, but it’s worthwhile to get something new for free and try it out! If you’d prefer to donate your exercise points to charity, you’ll want to sign up for Charity Miles. Signing up it easy – download the Charity Miles app to your phone, then choose your charity and either walk, run or bike. Your selected charity will earn money for every mile you cover. Walks and runners earn up to $.25 a mile, and bikers earn up to $.10 per mile. You can choose to donate to over 30 charities, including the World Wildlife Fund, The Nature Conservancy, Stand Up to Cancer, and many more. Don’t forget: you can sign up for all of these programs, if you’re so motivated. The best part of these websites and apps is that they’re not mutually exclusive, so go ahead and earn money through Pact while, at the same time, earning money for your favorite charity. 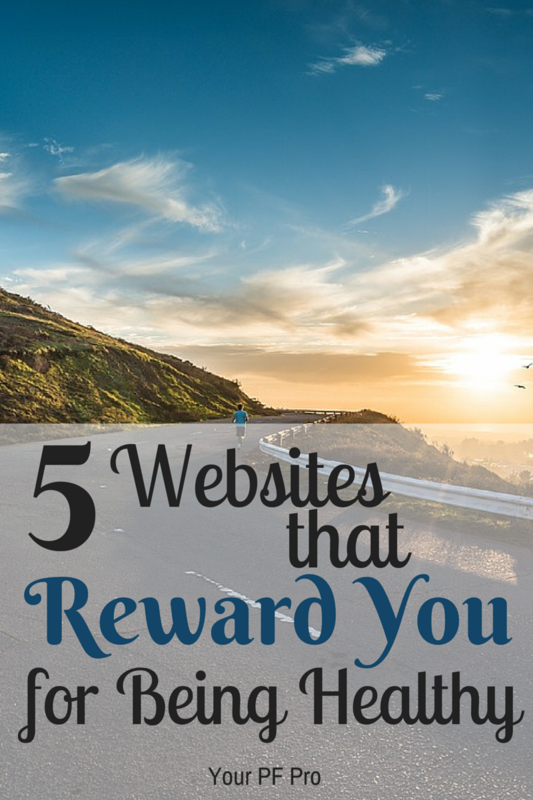 You also don’t have to be a marathon runner to enjoy and be rewarded by these companies. Like I mentioned, I’m not the most active person, but I’ve already earned a few rewards and points for my favorite charity. These websites and apps can help give an extra motivation boost to keep you active and eating healthy and, if you can make some extra money from it, that’s just a bonus! Thanks for sharing these sites. How do you like the Fitbit? You’re welcome, and I hope you find them useful! 🙂 I am loving my FitBit, although mine loses a charge after 2 days, which is getting annoying. I don’t know if I’m just hard on it (doubtful) or what, but I’m sure I’ll get used to it. Other than it dying too quickly, I am loving the tracking features. I never realized how little sleep I got until now – I always thought I slept really well, but I’m finding I’m actually very restless. It’s an eye-opening realization that I need to go to bed sooner to be fully rested. It should hold a charge for about a week. Mine starting doing that and FitBit sent me a replacement. Contact their customer service about it. More money + more exercise = winning at life! Interesting stuff. I never heard of any of these sites, but will be checking them out. In a related note, my wife took a new job and we have a new healthcare provider. This provider has us take an annual assessment to get a discount on our monthly premiums. Oh, I have the same thing with my healthcare provider, Jon! Some people at work hate it, because I think they’re worried our HR may contact them about getting healthy (although I think that would be a violation of privacy, but I understand their concerns), but I like it. It’s at least a reminder to go get your vitals checked every year, if you don’t already do it. I hope you and your wife check out some of those apps or sites – they’re pretty fun and a little extra motivation! 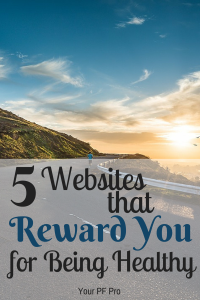 It’s very interesting and inspiring topic about these 5 Websites That Reward You for Being Healthy. I’m sure many will be glad to read this article. Thanks for sharing it. Fantastic post!